If you missed Xconomy’s April 11 forum Robots Remake the Workplace—or if you were there and you want to see some of the talks again—we have a special treat for you. Our friends at SRI International, the host site for the event, recorded the proceedings and just posted the eight-part video on YouTube. For your viewing pleasure, we’ve embedded all eight videos below. 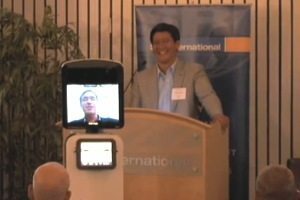 We invited a gaggle of top-flight roboticists to speak at this event—people like 3D Robotics CEO Chris Anderson, Rethink Robotics founder Rod Brooks, Aethon president and CEO Aldo Zini, InTouch Health CEO Yulun Wang, and iRobot CEO Colin Angle—and to be honest, we were surprised that they all said yes. On top of that, we were lucky enough to recruit Steve Jurvetson from Draper Fisher Jurvetson and Ajay Agarwal from Bain Capital Ventures for a great panel on the investing scene in robotics, and an amazing group of entrepreneurs and reseachers for additional panels hitting on telepresence, robots in unconventional workplaces such as movie studios and farms, and the “robots vs. jobs” debate. The result was one of the most entertaining and information-packed sessions I’ve ever had the pleasure of hosting. We’re extremely grateful to all of our speakers and guests, to SRI for hosting the event and recording the video, and to our event sponsor Silicon Valley Bank. 1. Welcome, Opening Remarks, and Keynote Address from Rod Brooks. Wade Roush, Chief Correspondent, Xconomy; Curt Carlson, President and CEO, SRI International; Rodney Brooks, Founder and CTO, Rethink Robotics. 2. Robots and Jobs Debate. Rich Mahoney, Director of Robotics, SRI International; Aaron Edsinger, Co-founder and CTO, Redwood Robotics; Vivek Wadhwa, Vice President of Academics and Innovation, Singularity University; Wade Roush (moderator). 4. Telepresence Robots in the Office. David Cann, Founder, Double Robotics; Keller Rinaudo, Founder and CEO, Romotive; Marcus Rosenthal, CEO, Revolve Robotics; Wade Roush (moderator). 6. Robots in Unconventional Workplaces. Jim McCollum, CEO, Restoration Robotics; Wasiq Bokhari, Founder and CEO, Qbotix; John Kawola, CEO, Harvest Automation; Ian Sherman, Head of Development, Bot & Dolly; Wade Roush(moderator). 7. Remote Presence Robots in the Clinic. Yulun Wang, CEO, InTouch Health; Colin Angle, Co-founder and CEO, iRobot.